From the syndicated Saturday morning kid's show,this is a pull-string toy that 'talks' like a monkey, but doesn't say any words. Unusual. Land of the Lost was a 1970's kid's show that relied on lots of cheesy blue-screen special effects that never looked very convincing. In the early 1990's, the show was remade with a new cast and better effects. 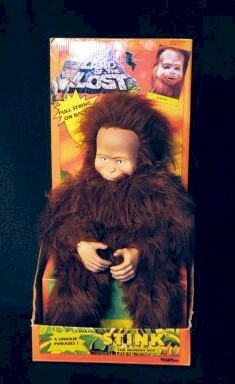 This doll is from the second incarnation of this show. Website design and hosting by Sohodojo Business Services. Item 229 of 466 items displayed in viewer. 0 items in cart.